Published by Avon Books. 1968. pp 67 – 71. This [legend] goes back to the time of the Emperor Asoka, who reigned in India from 273 B.C. He was the grandson of Chandragupta who was the first to unify India. Ambitious like his ancestor whose achievements he was anxious to complete, he conquered the region of Kalinga which lay between what is now Calcutta and Madras. The Kalingans resisted and lost 100,000 men in the battle. At the sight of this massacre Asoka was overcome. Forever after he experienced a horror of war. He renounced the idea of trying to integrate the rebellious people, declaring that the only true conquest was to win men’s hearts by observance of the laws of duty and piety, because the Sacred Majesty desired that all living creatures should enjoy security, peace and happiness and be free to live as they pleased. It is still thought that the great men responsible fro the destiny of modern India, and scientists like Bose and Ram believe in the existence of the Nine, and even receive advice and messages from them. persons and to pursue knowledge which would benefit mankind. secrecy of techniques handed down from ancient times. Had other Europeans any contact with the society of the Nine Unknown Men? It was not until the nineteenth century that this mystery was referred to again in the works of the French writer Jacolliot. Jacolliot was French Consul at Calcutta under the Second Empire. He wrote some quite important prophetic works, comparable, if not superior to those of Jules Verne. He also left several books dealing with the great secrets of the human race. A great many occult writers, prophets and miracle-workers have borrowed from his writings which, completely neglected in France, are well known in Russia. Jacolliot states catagorically that the Soceity of Nine did actually exist. And, to make it all the more intriguing, he refers in the this connection to certain techniques, unimaginable in 1860, such as, for example, the liberation of energy, sterilization by radiation and psychological warfare. detailed account of some science. The second book was on physiology. It explained, among other things, how it is possible to kill a man by touching him, death being caused by a reversal of the nerve-impulse. It is said that Judo is a result of “leakages” from this book. The third volume was a study on microbiology, and dealt especially with protective colloids. The fourth was concerned with the transmutation of metals. There is a legend that in times of drought temples and religious relief organizations received large quanities of fine gold from a secret source. The fifth volume contains a study of all means of communication, terrestial and extra-terrestial. The seventh contains the most exhaustive cosmogony known to humanity. The ninth volume, on sociology, gives the rules for the evolution of societies, and means of foretelling their decline. Connected with the Nine Unknown Men is the mystery of the waters of the Ganges. Multitudes of pilgrims, suffering from the most appalling diseases, bathe in them without harming the healthy ones. The sacred waters purify everything. Their strange properties have been attributed to the fact that they contain bacteriophages. But why should these not be formed in the Bramaputra, the Amazon or the Seine? Jacolliot in his book advances the theory of sterilization by radiation, a hundred years before such a thing was thought to be possible. These radiations, he says, probably come from a secret temple hollowed out in the bed of the Ganges. Avoiding all forms of religious, social or political agitations, deliberately and perfectly concealed from the public eye, the Nine were the incarnation of the ideal man of science, serenely aloof, but conscious of his moral obligations. Having the power to mold the destiny of the human race, but refraining from its exercise, this secret society is the finest tribute imaginable to freedom of the most exalted kind. 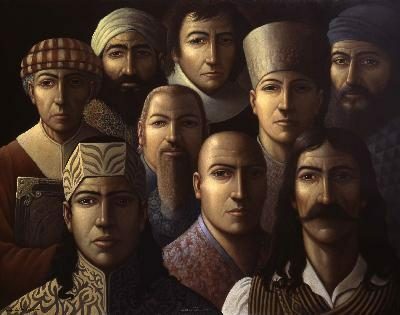 Looking down from the watch-tower of their hidden glory, these Nine Unknown Men watched civilizations being born, destroyed and re-born again, tolerant rather than indifferent, and ready to come to the rescue — but always observing that rule of silence that is the mark of human greatness. Myth or reality? A magnificent myth, in any case, and one that has issued from the depths of time — a harbinger, maybe, of the future?